The miracle of the loaves is contextualised by the feast of Passover which celebrates God freeing Israel and leading them through the wilderness until they finally reached the Promised Land. On that journey in the desert God provided nourishment in the form of manna. Now Jesus is going to replace this bread with the Bread from heaven. Hence the miracle of the loaves anticipates Jesus giving his Body and Blood as food for the journey in this life to the new promised land in heaven. Today’s Gospel is about Jesus replacing the former gift and bringing to completion all of God’s promises, but it ends with a twist. The people had misunderstood what Jesus was offering because what they hungered for was what satisfied their bodily, not their spiritual appetites. This begs the question what are we hungering for? We can say we feed off other people’s emotions: excitement, joy, happiness and the love of our loved ones. For example, a baby feeding from its mother’s milk also feeds from her tender caresses, her smile, the sound of her voice, her love. We conclude that there are different things we hunger for, and mostly our appetites are good and wholesome. BUT although many things are good, the Gospel teaches us that what is most important is we hunger for spiritual food. That food is the Eucharist which alone can satisfy us in every way. All bodily appetites are transient and although they serve to keep our bodies alive in this life the Eucharist alone is what sustains us until we reach the next. It brings us into communion with the God of life and each other. At the deepest level, the Eucharist satisfies our hunger for life. As crazy it would be to starve ourselves of food for the body it would be even more crazy for us to deprive ourselves of the food of life. The life-giving nourishment we receive from communing with Jesus is attested to by many miracles. For example, Bl. Alexandrina da Costa (1904-1955) was a mystic and victim soul who lived in Portugal. She was paralysed and forced to remain in bed for approximately 30 years until her death. She began to receive extraordinary mystical graces, and was eventually called to be a victim soul, that is, to suffer in union with Jesus for the conversion of sinners. On March 27, 1942 in a blaze of agony and adoring love, Alexandrina cried out to Jesus in the tabernacle of the nearby church, "Oh my Eucharistic Love, I cannot live without you!" Deep within her soul she heard Jesus’ profound reply: "You will not take food again on earth. Your food will be my Flesh; your blood will be my Divine Blood, your life will be my Life." 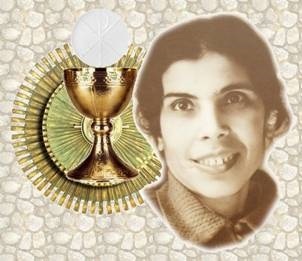 Thus, on March 27, 1942 Alexandrina began an absolute fast which was to last more than thirteen years until her death, her sole nourishment being Holy Communion which she received with deep devotion every morning. A beautiful miracle that helps us recognise the importance of the Eucharist that nourishes us with spiritual, but also life-sustaining food. Let’s give thanks for the Bread of life.